So here is my first pregnant belly picture for baby 3. I’m not one of those enthusiastic mamas that takes a picture or herself every week, or even every month for that matter, but I’ll be proud of myself if I get 2 or 3 good pictures this pregnancy. Why don’t I take belly pictures? 2. Even if my belly does look cute I have to remember my face. I don’t wear make-up on a regular basis, I mean the only people that see me most of the day are 3 years old and 10 months old so why bother. But if I’m not wearing make-up in a picture I look like a ghost. 3. My outdated maternity wardrobe. 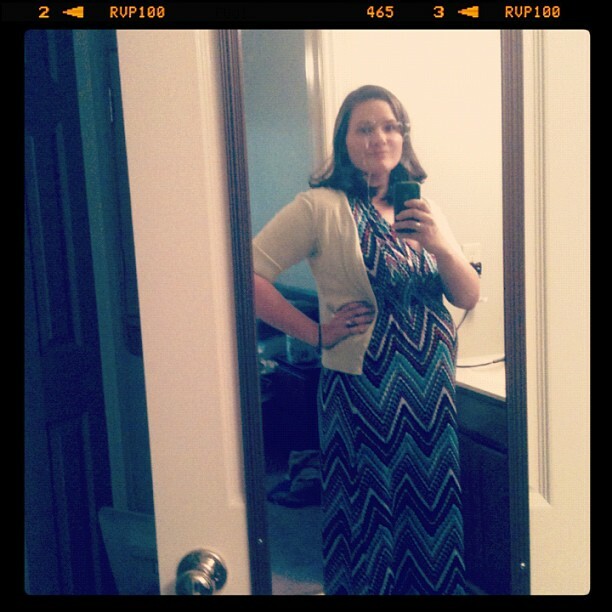 Most of my maternity clothes are from my 1st pregnancy, over 4 years ago. Anything I’ve picked up new since this is probably for function only and from the clearance rack at Target. So needless to say I’m not the most trendy pregnant mama. 5. I just plain forget. So don’t hold your breath for weekly pictures of baby 3. I can pretty much describe what I’ll look like on any given day.